Shore Service Dogs, Inc., a small corporation registered in Maryland as a non-profit organization, was created to provide second chances for both people and dogs in need of assistance. Located on Maryland's beautiful Eastern Shore, SSD brings abandoned, and abused dogs, into our founder's home and custom trains them to become Service Dogs for people with mobility disabilities. 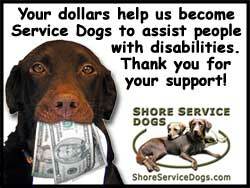 Shore Service Dogs relies on fundraising, grants and charitable donations from businesses, corporations, civic organizations and individuals to offset the costs of training these amazing dogs. Your support helps make our goal of assisting others possible. Please, help us help those who's lives would be made easier with the aid of these wonderful dogs! Although they didn't show his earlier teasers of him painting while he was awake, here's the video of the interview where he showed that he's so talented, he can almost paint in his sleep. Now there's REAL talent for ya! One of Sammy's recent artistic endeavors was part of a wonderful art expo that opened in NYC at the Denise Bibro Fine Arts Gallery! Entitled "Going to the Dogs", this canine themed exhibition showcased the works of 22 artists and 3 painting pooches, and was on view October 8 through November 7, 2009. The exhibition of painting, photography, video, and mixed media sculptural assemblage, was a celebration of man's best friend and a portion of the sales proceeds benefited Animal Haven, a nonprofit organization that finds homes for abandoned cats and dogs throughout the Tri-State area. The show's painting puppers even had their own exclusive story on AOL, "Painting Pups: When Dogs Let Loose on Canvas ". Those AOL journalists are obviously connoisseurs of fine art! 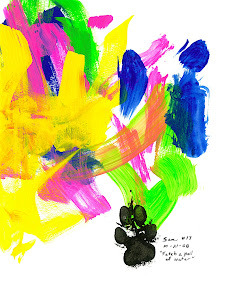 Sammy's muttsterpiece displayed in the show was created last Oct. during a photoshoot for a Jack & Jill magazine article that was done about the SSD Doggie Da Vincis. Sammy broke from his solo traditions and was assisted by a wonderful young boy by the name of Gabriel Rincon who did a fantastic job aiding our furry artiste! Gabriel and Sammy had a blast creating this cheerfully uplifting piece and it's extremely obvious by the pictures that they're both naturals for the camera. Needless to say, we felt that the title "Fetch a pail of water", was just the perfect finishing touch to this joyfully colorful duet! We are very proud to relay that Sammy's piece found a new forever home out in Wisconsin! We hope that they enjoy it as much as Sammy enjoyed creating it. We'd wished that more of the paintings in the exhibit had been adopted too (Sammy's BTW was the only canine created piece to find a home) but we're very glad that we were able to assist in raising awareness for puppers and kitties in need of assistance in these hard times. If you're interested in seeing more of the Doggie Da Vinci PAWièce de résistance pieces at the art gallery in the future, please contact the gallery at 212-647-7030, info@denisebibrofineart.com, or visit www.denisebibrofineart.com. I'm sure they would love to hear from the fans of our Puppy PAWcassos! What is Sam’s art saying? 1st Little Screen... now Big Screen. The pups popularity just keeps "growing"! Last year the puppers moved up in screen size and were part of the making of a new heartwarmingly funny Indie movie, appropriately titled "ArtHouse ". Starring well known performers as Greta Gerwig, Lyn Alicia, Timothy Brennan, and Iggy Pop, this lighthearted and quirky comedy is directed by the award winning talents of Victor Fanucchi. Currently it is competing in national and international film festivals and hopefully it will have its world premeire in a theater near you so keep watch on their website to see where it will show next! NOTE: Not sure why this isn't showing as an embedded video but you can still view it by clicking this "Art House" Trailer link. The Doggie Da Vincis Were Featured On French TV's TF1 & National Geographic TV's "Dog Genius" Program! The pooches here at Shore Service Dogs are getting quite a bit of publicity both on air and in print. They're famous around the world and their popularity just seems to keep growing by leaps and bounds! Recently the Doggie Da Vincis were featured on several TV programs. One was a feature documentary by the French TV station TF1. Unfortunately, the video clips are still in production so we aren't able to post them at this time. But make sure to keep checking back for it to go live on the site! The puppers were also part of National Geographic Television's program, "Dog Genius" ! This program was one of the installments of their highly acclaimed, Animal Genius series that has showcased various species' prodigies. 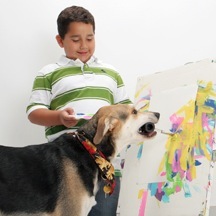 The guys had a number of their Service Dog tasks shown as well as a demonstration of their famous artistic prowess. We hope you got a chance to watch it! While this clip of the program unfortunately does not show our amazing dogs here at Shore Service Dogs, it does show some wonderful examples of various Mobility Service Dogs tasks. It also explains how some organizations go about the breeding and preparing of puppies to become Service Dog trainees. Painting Pups! No, Really... They Paint!! Ah, the joys of fundraising. So important and yet not so much fun. But we decided to change that! So our dogs have been hard at work learning a new skill... they can now paint! No, not by walking across canvases with painted paws. Not even by scratching at canvases. Our dogs are over achievers. They do it with paintbrushes held in their mouths and they paint canvases on easels no less! They're even starting to learn how to choose their own colors so that the artwork is entirely created by them! Don't believe it? Check out some of their paintings and videos! Make sure to also check out the items that have been donated to local animal charities to help them raise much needed funds. Our current charity auctions will even be featuring a guitar body painted by both Major & Sammy during the filming by French television TF1. PS... If you go to the Shore Service Dogs' YouTube Videos page, please make sure to rate the videos. The higher the rating the more people will learn about Service Dogs! Shop in the Online mall at www.iGive.com and help by choosing Shore Service Dogs as the organization you'd like to help when you join. iGive has hundreds of different online stores including PetsMart, PETCO, Pet Food Direct, Drs. Foster & Smith, 1-800 Pet Meds, CircuitCity, BestBuy, QVC, airlines, hotels, wine shops, electronics, computers, gourmet chocolates, golfing, car rentals, cell phone companies, office supplies, pretty much ANYTHING & EVERYTHING you could possibly need! *** IT DOESN'T COST ANYTHING TO JOIN OR USE *** and you'll get the same fantastic (and sometimes even better) deals you'd get by visiting the online stores directly. But each time you make a purchase through iGive, a percentage of your total purchase price will be automatically donated to help SSD train more dogs to help those in need. In addition, for every new member that signs up and chooses SSD as their charity, they'll also donate an extra $5.00. So tell all your friends about it and not only will they get some fantastic deals, they'll be helping a wonderful cause while they shop till their fingers drop! Over 700 great stores you know & love with new stores being added all the time! Exclusive deals to save you $100s! Free Shipping offers and coupons!! Great low prices and you'll be helping SSD while you save with the stores donating up to 27% every time you shop!